LEXINGTON, Ky. (Aug. 8, 2011) — The University of Kentucky's Davis Marksbury building, part of the UK College of Engineering's Digital Village, has just been certified as a LEED® Gold building by the U.S. Green Building Council (USGBC), making it the first building at UK to receive a LEED certification. LEED, (Leadership in Energy and Environmental Design) is the USGBC's leading rating system for designing and constructing the world's greenest, most energy efficient and high performing buildings. 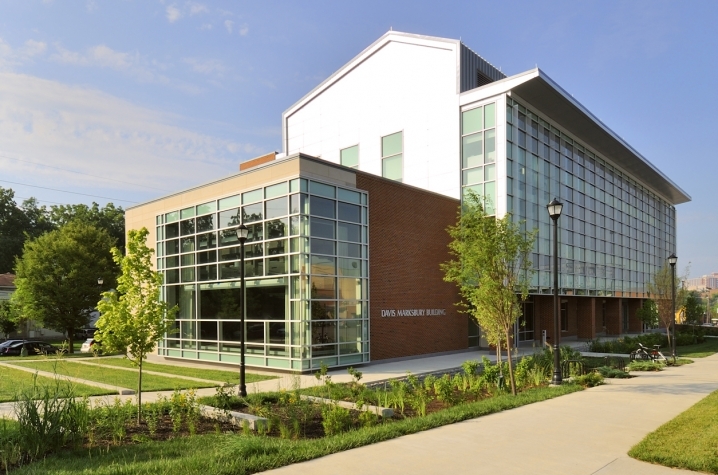 "Given the College of Engineering's role as a leader in advancing environmental-related research in efficient energy production, it is extremely appropriate that the Davis Marksbury Building — a building dedicated to engineering and computer science research — is not only the first LEED certified building on UK's campus, but a Gold-certified building as well," said Thomas Lester, dean of the college. The LEED certification was based on a number of design and construction features that positively impact the project itself and the broader community. Named for College of Engineering alumnus and lead donor Davis Marksbury, the three-story, 45,014-gross-square-foot building includes photovoltaic collectors on the roof to convert sunlight into electrical power to help serve the building and provide research opportunities. The first floor houses an administrative suite, an auditorium that seats up to 100, a visualization lounge and media suite, and a computer lab. The second and third floors house hard and soft laboratories for computer-program development and research, as well as faculty offices. The third floor also houses a penthouse that contains air-handling equipment for the building. "The Davis Marksbury building's LEED certification demonstrates tremendous green building leadership," said Rick Fedrizzi, president, CEO and founding chair of USGBC. "The urgency of USGBC’s mission has challenged the industry to move faster and reach further than ever before, and the Marksbury building serves as a prime example with just how much we can accomplish." The Marksbury Building is home to the UK Center for Visualization and Virtual Environments, as well as the departments of Computer Science and Electrical and Computer Engineering. While it opened in February of this year, an official dedication and open house will take place Thursday, Oct. 20, during which the public will be invited to tour the facility. Funding for the project was announced in December 2008, after the Marksbury Family Foundation, created by Davis and Beverly Marksbury, contributed $6 million to the project. Another $3.6 million was provided by private donors, with the remaining $9.3 million coming from the state's Research Challenge Trust Fund. 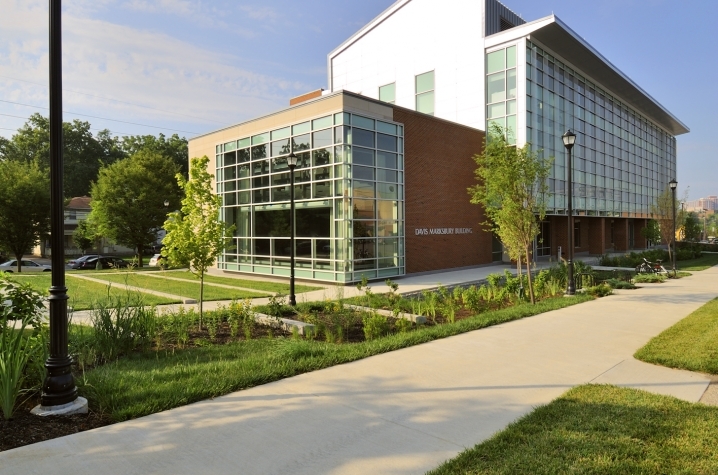 "As the University’s first LEED-certified Gold project and our first facility to be constructed solely using private support and matching funds from the state's Research Challenge Trust Fund, the Davis Marksbury Building represents a creative approach to addressing specific capital needs," said UK President Eli Capilouto. "It provides new space for innovative, multidisciplinary research and is the type of facility our undergraduate and graduate students require to prepare for jobs in a 21st century economy." Shane Tedder, coordinator of UK's Office of Sustainability, says the certification is a major step in creating a more sustainable campus. "Receiving LEED Gold for this facility is a great success for our campus and one that we will certainly learn from and build upon as we work to integrate environmental stewardship and social well-being into all facets of the university," he said. "LEED certification signifies a commitment to provide a healthier environment, thus leading to a better quality of life for the users and occupants of certified buildings," said David Collins, senior project manager in the UK Capital Project Management Division. "It includes better indoor air quality while promoting a more energy efficient building with a lower carbon footprint, again leading to an overall healthier environment for the community. The architects, engineers and construction managers spent a great deal of effort in planning and follow-through to reach beyond the goal of LEED Silver that was originally targeted for this building. 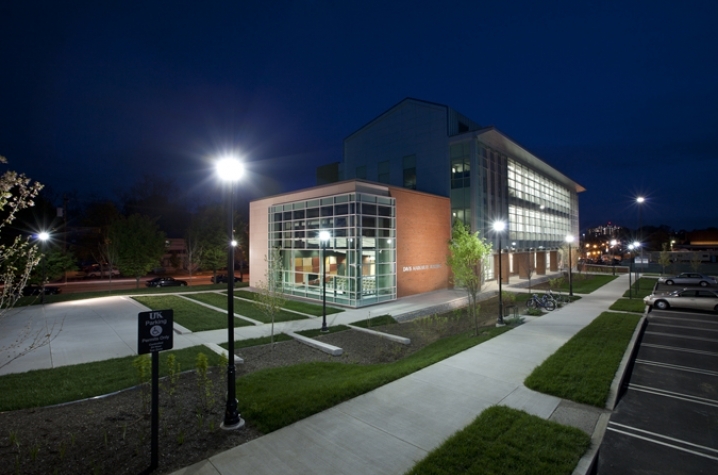 Achieving LEED Gold represents a significant milestone for UK and for the College of Engineering. I understand it is the first LEED Gold building in the state that has been certified under the newer and more stringent NC v2009 rating system." The LEED Green Building Rating System™ is a feature-oriented rating system that awards points for satisfying specified green building criteria. The six major environmental categories of review include: sustainable sites, water efficiency, energy and atmosphere, materials and resources, indoor environmental quality and innovation and design. Certified, Silver, Gold, and Platinum levels of LEED green building certification are awarded based on the total number of points earned within each LEED category. USGBC is a nonprofit membership organization that includes corporations, builders, universities, government agencies, and other nonprofit organizations. For more information, visit www.usgbc.org.